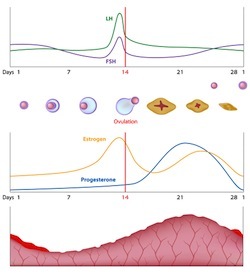 Fertility specialists currently use GnRH analogue injections to stop spontaneous surges in LH (luteinizing hormone) in female patients being treated with assisted reproductive technology. Researchers recently revealed the calcium channel blocker, nimodipine, may be as effective as GnRH analogue injections. The study was published in the Reproductive Biology and Endocrinology journal. The study was extremely small with only eight participants. Participants self-monitored LH surge using daily urine testing. Cycles 1 and 3 were used for informational purposes only. During cycle 2, patients took 60 mg of nimodipine three times a day for four days. Medications were started two days before LH surge was expected (based on cycle 1 results). Conclusion: Nimodipine significantly delayed LH surge, but three of the eight patients experienced headache. The headache could have been the result of taking nimodipine, but there is no way to rule out other possible causes. Nimodipine may be useful as an alternative to GnRH analogue injections, but larger studies are needed. Source: Nayot D, Klachook S, Casper RF. Nimodipine, a calcium channel blocker, delays the spontaneous LH surge in women with regular menstrual cycles: a prospective pilot study. Reprod Biol Endocrinol. 2013 Feb 7;11(1):7.